We think it should be just as easy to deploy virtual servers and services in your own data center as it is in our public cloud. That’s why we built the Engine C1. Now we are working on the successor – the Engine C2. Are you a hosting provider who wants to clean up your infrastructure platform, offer your customers a modern IaaS cloud, and reduce hardware and software expenses? Then Origo Engine is the perfect match! Pre-order an Engine C2 directly from us, and get an on-premises private cloud without complicated procurement and implementation. Plug it in, turn it on, and you are ready to deploy virtual servers in minutes. But what about service continuity and data integrity you ask? Engine C2 comes with integrated monitoring and backup of all your virtual servers. For extra peace-of-mind we also offer replication of all your data to Origo Cloud. The Engine C2 Comes pre-loaded with the Origo Compute 1.3 software stack, ready-to-run, and with auto-update it’s always running the latest and greatest version you are running. 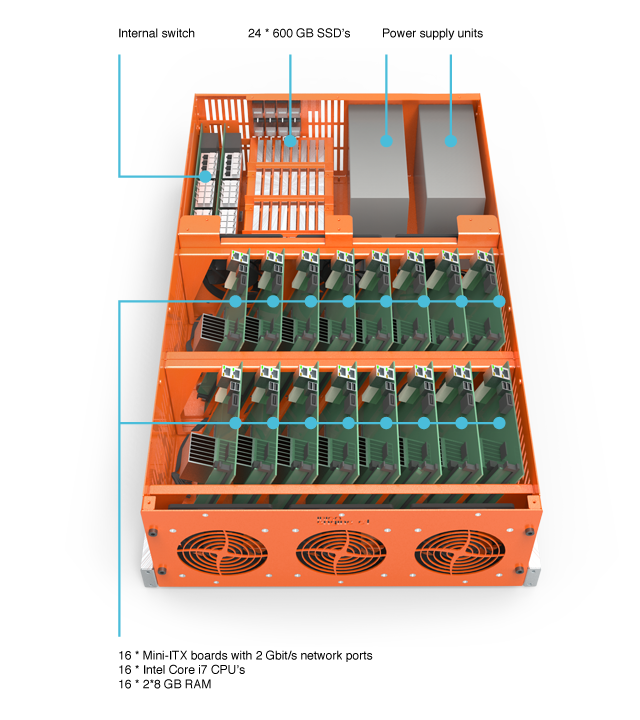 We have packed 17 independent physical servers with 17 quad-core CPU’s, 2 TB memory, 24 SSD-disks, built-in layer-2 10 Gbit switching and two 10 TB sata-disk for backup into one 4U box. You can even choose to PXE-boot and join existing server hardware to your new private cloud. The Engine C2 will also come with built-in Li-ion battery cells for backup emergency power. The Origo Compute software stack handles ressource allocation, and optimizes energy use. When processing load is low, motherboards and CPU’s power down so they don’t use energy. 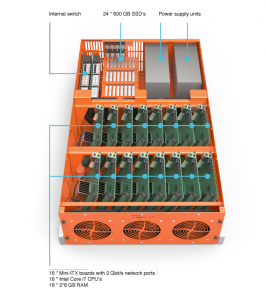 Virtual servers may use NVMe as direct-attached storage for unmatched performance. 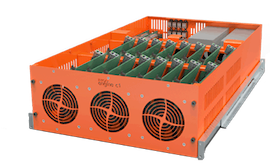 This allows Engine C2 to support even your transaction-heavy database servers. Less I/O intensive servers may make use of the advantages of shared storage. You can purchase Origo Engine C2 with a service agreement which gives you regular free software updates and other benefits. Security updates are always included.